Support | Lin's Linens, Inc. Contribute to Lin’s Linens, Inc.
All charitable giving to Lin’s Linens, Inc. is used to directly support women who are in treatment for cancer. Your tax deductible financial support ensures our ability to continue to make a difference in our Program Sisters lives. We are grateful for all contributions made and for donations of $250 or more Lin’s Linens, Inc. will thank you with one of our signature gift items. Agates are the touchstones for the Lin’s Linens, Inc. program. Their meaning and power closely link to our core values. Agates are stable and grounding and can bring about balance — emotionally, physically and intellectually. They are stones of great strength but work slowly over time to calm and soothe, gently facilitating acceptance of oneself. 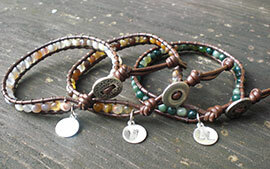 Lin’s Linens, Inc. proudly offers our Signature Agate Bracelets for $30, plus a small $3 shipping charge. Whether for your own comfort or as an alternative to flowers or fruit basket to be sent to someone whom you care about, this enveloping, warm and loving blanket is the perfect gift. Lin’s Linens, Inc. proudly offers our signature throw blanket for $48 (plus $12.95 shipping). Please make checks payable to Lin’s Linens, Inc.